If Jason Micallef was the proverbial albatross around Joseph Muscat’ neck... what similar foreboding avian would his Nationalist counterpart Paul Borg Olivier be? The PN secretary-general continues to impress with his poor grasp of what his high office entails. His careless speech on Marisa Micallef (formerly Leyson) selling herself out to Labour has made public the substance of internal discussions within the Pietà headquarters – something a secretary-general should not be making so obvious. 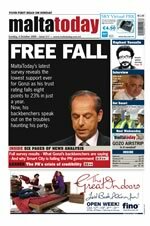 This week he claimed that PN ‘defector’ Marisa Micallef – sometime Housing Authority chairperson, a personal cheerleader of then social policy minister Lawrence Gonzi, and now personal advisor to Labour leader Joseph Muscat – had fallen victim to the financial crisis: “I understand she was unhappy the government was not able to provide her with a job, but the government is not an à la carte restaurant,” Borg Olivier crudely pointed out. Entertaining though his frankness might be, the churlishness of his comment betrays the feeling inside GonziPN. Borg Olivier’s role should have been that of giving the opposite impression, and letting the party’s minion media do the dirty work of rubbishing Micallef and hanging out her empty wallet for all to see. Daphne Caruana Galizia’s allusion to prostitution (“thousands of otherwise decent women the world over resort to being paid for sexual services to pay the bills when they’re really on their uppers and have children to raise”) was raw enough. Since there were other ways of saying that Marisa Micallef had been pining for a cushy government post, Borg Olivier’s careless language makes him sound a tad rash at best, at worst, idiotic, given his political profile. Borg Olivier is no stranger to gaffes. This year, thanks to his notorious email blunder, he revealed a top-secret discussion within the party’s inner circle about how to transfer confidential information about complainants to government ministries to the Nationalist party, in full defiance of data protection laws. Mistakenly copying the email to Jason Micallef instead of parliamentary secretary Jason Azzopardi, his gaffe made a proper monkey out of the man. Further illustrating his lack of strategy was the fact that he was then advised to avoid calling a press conference to reply to Joseph Muscat’s blistering comment on the inside email. And when he did go ahead with the press conference, the news was relegated to the sixth item on the PN’s 7:45pm news bulletin on Net TV. Not to mention the fact that, after having realised that he sent Jason Micallef the email, he repeatedly called him on his mobile, sent him an SMS to get in touch with him, and finally spoke to him a day later to ‘spare him the trouble’ of broadcasting the damning email. But apart from his penchant for human error, Borg Olivier still lacks the ruthlessness and method of his predecessor Joe Saliba, a man who understood when to be economical in speech. Saliba never gave journalists too much, often leading to lacklustre interviews. And he tended to be barefaced about embarrassing episodes such as his holidaymaking with party benefactor Nazzareno Vassallo, the election-time Mistra scandal, or disheartening local council election results. To put it simply, Saliba had a knack for taking flak. Paul Borg Olivier’s knack seems to be that of having a constant stream of egg-yolk dripping from his face.